Click on the image to launch a full-size version of the chart. The topic of pensions for public school employees has received a lot of attention lately and it is important for taxpayers to understand the impact that pension obligations have on their local school district’s budget both now and in the long term. 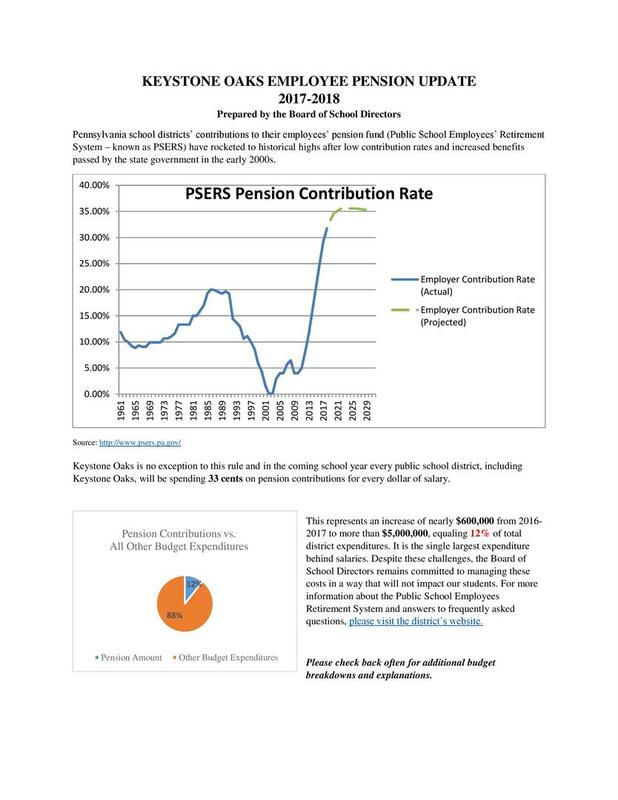 The Keystone Oaks School District has prepared this graph to demonstrate the drastic increase in employer contribution rates. Below, you’ll find more information about the Public School Employees Retirement System and the pension funding crisis that school districts across the Commonwealth are faced with today. The Public School Employees Retirement System (PSERS) was established in 1917 to provide retirement and disability benefits to public school employees. It is a governmental cost-sharing, multi-employer defined benefit pension plan that is funded through three sources: contributions from employees (members), the employer contribution rate which is contributions from employers (generally school districts) and the Commonwealth, and investment returns from the System. PSERS has a governing board of trustees which exercises control and management of the system, including the investment of its assets and setting the annual employer contribution rate. A defined benefit plan is one in which the retirement benefit is determined when the plan is established. Employee’s years of service X the employee’s multiplier, either 2 percent or 2.5 percent, X the employee’s average three highest years of salary = Employees annual salary during retirement. For example, an employee with 30 years of service, a 2.5% multiplier, and a three-year average salary of $100,000 would earn $75,000 per year. It is important to note that employees do not benefit from strong returns on investments or bear the investment risk of a down market. The defined benefit formula remains the same regardless of market performance. When the fund is benefiting from strong returns on investments, employers (and taxpayers) benefit from lower contribution rates. When a drop in the market impacts the fund, employers are faced with higher contribution rates. What caused the funding crisis? In the early 2000s, the PSERS system was benefiting from strong returns on investments and, as a result, legislation was passed in 2001 and 2003 that lowered the employer contribution rate. The employer contribution rate is mandated by the PSERS governing board school districts cannot increase or decrease their contribution rate. The stock market crash that followed after September 11, 2001, coupled with the dot com bust and other economic downturns, led to a significant decrease in the system’s funding level and caused the pension crisis that we are faced with today. Sixty percent of the PSERS system is funded by investment returns. As a result, the PSERS system now has a $42.7 billion unfunded liability and school districts are faced with drastic increases in the employer contribution rate to help fill the gap so that the system can meet its current and future obligations. How is Keystone Oaks School District affected by this? Every public school district in the Commonwealth of Pennsylvania pays the same employer contribution rate to the PSERS system and is faced with the challenge of meeting the system’s obligations. In 2009-10, employers paid a contribution rate of less than 5 percent. The contribution rate for the 2017-18 school year is 32.57 percent. In seven short years, all school districts have gone from paying $0.05 per $1 of salary to the PSERS system to paying almost $0.33 per $1 of salary. Looking ahead, districts will spend $0.36 per $1 of salary in the 2021-2022 school year. Keystone Oaks School District expects to spend nearly $5 million on employee pension benefits during the 2017-2018 school year. The district receives a 50% reimbursement from the Commonwealth for pension contributions, but those costs are reimbursed quarterly and the district must contribute to the pension fund each payday. There is little that can be done to alter the pension benefits that had been promised to employees already in the PSERS system. Act 120 of 2010, passed by the Pennsylvania State Legislature and signed by Governor Ed Rendell in 2010, made changes to the system for new members beginning July 1, 2011. There is now a “shared risk” provision that could cause employee contribution rates to increase at any time depending on investment performance. Employees are now vested at 10 years of service, as opposed to 5 years of service. The 2.5% multiplier only applies to employees who have contributed a base rate of 10.3%. Employees could opt to contribute 7.5% and receive a 2% multiplier. Normal retirement age was increased to 65 years of age, with 3 years of service, or total combination of age and service that is equal to or greater than 92 with a minimum of 35 years of service. Employees can no longer withdraw their pension payment in one lump sum. The Keystone Oaks Board of School Directors has remained committed to managing these increasing costs and has met the district’s obligations without significant tax increases and while adding programs, classes and staffing to meet the ever-changing needs of Keystone Oaks students.